This past Sunday (April 7) at Alms Offering Service, for the Dhamma portion, Venerable Na Long spoke about a lady at our center who has been coming to the center every day, and has never missed Alms Offering. However today, her seat is empty. The Venerable went on speaking about this lady’s situation and the wisdom that we can gain. The Venerable stated that there will be challenges and obstacles in life, but we must always stay the course and use the accumulation of merit as your refuge. I was asked by a lay devotee to write about this ladies incident since there is wisdom that one can learn from her situation. 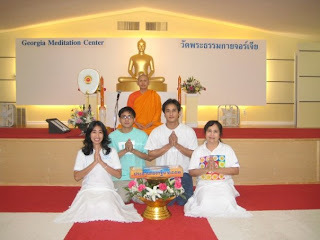 There is a member at the temple that started coming since the inception of the Georgia Meditation Center in 1998. She never missed an Alms Offering Service held every Sunday and always is in attendance for all ceremonies. She is very involved at the center always helping to motivate others to accumulate good deeds, and has introduced many to join the center and attend service. She conducts her life accordingly to the teaching of the center with daily practice of meditation, upholding the 5 precepts, and acts of generosity. She truly is an inspiration for others and is a true virtuous peace leader. She has proven time and time again, by her actions and service to the center how dedicated and genuine she really is...my mother. Recently, an unfortunate situation occurred, my mother was injured. All I could wish for is merit not to fail my family now, wishing that for any situation that might be heavy to be light instead, and for my mom to ultimately be fine. I am so relieved to say my mother will be fine, and her scars will heal. My mother has proven that she is not only a warrior with the ultimate love for her child, but she is also a soldier of goodness. She is my hero, and my captain, who has guided me to be who I am today, a lover of doing good for the world, a soldier for peace. The next day after her injury my mother asked for us to go to the temple to accumulate more good deeds for our family. She reminded us (myself and my brothers) that when it comes to relaying on anything we must rely on our good deeds to get us through, and that she knows she is protected, because of all the good she has done thus far. My mother is a great example of perseverance of accumulating good deeds and believing in merit no matter what. That though challenges come in our life we will not back down, and wonder why our goodness did not protect us. When it comes to Karma we just never know what consequence will bear its fruit, all we can wish for, if unfortunate situations are to occur due to remnants of Karma, let them be light, not heavy circumstances. We have confident and faith in the good deeds that we accumulate and our goodness and virtues will always protect us. And even if it doesn’t, we will realize that sometimes some things are just meant to be and we have no control. And that my friends is Karma. Believe in Merit, Believe in doing good and recall on them to protect you. Today is my mother’s birthday and to celebrate her birthday she made an offering to the Venerable. I wanted to share her story with you in hopes that it may help inspire you to accumulate good deeds for yourself by meditating, upholding precepts, and acts of generosity, her story is one that we can learn something from. Those of you who know my mom, know how dedicated she is in accumulating good deeds. Instead of buying her a present, she asked each of her children (me, Nat, and Timmy) to share in making a birthday offering with her, she wanted no material object, but rather wanted to make merit. Since monks meditate 4-6 hours a day, and uphold 227 precepts, for us, we believe they are our fertile fields of merit. Thus, just like a seed that is to be planted, we should be selective with the type of soil we plant the seed in, the more fertile the soil the better the yield. Likewise, the more purified a person is, an act of good deed towards that person, accumulates a high return of merit accordingly. Merit and Demerit are behind all things, accumulate only good deeds, and protect yourself. Believe in merit. It is real! Which things do Buddhists do differently to those of other religions? Buddhism is a very old and diverse religion. Thus, there have been many attempts to summarize the features which Buddhists have in common and hence how these differ from those of other religions. The most famous of these are Colonel Henry Olcott's fourteen points: Buddhists are taught to show the same tolerance, forbearance, and brotherly love to all men (people, ed. ), without distinction and an unswerving kindness to the members of the animal kingdom. The universe was evolved, not created; and it functions according to law, not according to the caprice of any god. The truths upon which Buddhism is founded are natural. They have, we believe, been taught in successive kalpas, world periods, by certain Illuminated beings called Buddhas, the word Buddha meaning enlightened. The fourth Teacher in the present kalpa (aeon) was Sakyamuni or Gautama Buddha, who was born in a royal family of India about 2,500 years ago. He is an historical personage and his name was Siddhartha Gautama. Sakyamuni taught that ignorance produces desire (craving unsatisfied desire is the cause of rebirth, and rebirth the cause of sorrow). To get rid of sorrow, therefore, it is necessary to escape rebirth; to escape rebirth, it is necessary to extinguish desire; and to extinguish desire, it is necessary to destroy ignorance. Ignorance fosters the belief that rebirth is a necessary thing. When ignorance is destroyed, the worthlessness of every such rebirth, considered as an end in itself, is perceived, as well as the paramount need of adopting a course of life by which the necessity for such repeated rebirth can be abolished. Ignorance also begets the illusive and illogical idea that there is only one existence for man (humankind), and the other illusion that this one life is followed by states of unchangeable pleasure or torment. The dispersion of all this ignorance can be attained by the persevering practice of an all-embracing altruism in conduct, development of intelligence, wisdom in thought, and destruction of desire for the lower personal pleasures. The desire to live being the cause of rebirth, when that is extinguished, rebirths cease, and the perfected individual attains by meditation that highest state of peace called Nirvana. Sakyamuni taught that ignorance can be dispelled and sorrow removed by the knowledge of the four Noble Truths, i.e. the miseries of existence the cause productive of misery, which is the desire (craving, ed. ), ever renewed, of satisfying oneself, without ever being able to secure that end the destruction of that desire or the estranging of oneself from it. The means of obtaining this destruction of desire. The means which he pointed out is called the Noble Eightfold Path: i.e. : Right Belief, Right Thought, Right Speech, Right Action, Right Means of Livelihood, Right Exertion, Right Remembrance, Right Meditation. Right meditation leads to spiritual enlightenment, or the development of that Buddha like faculty which is latent in every man, The essence of Buddhism, as summed up by the Tathagata (Buddha) himself, is " 'to cease from all sin, to get all virtue, to purify the heart'. The universe is subject to a natural causation known as karma. The merits and demerits of a being in past experiences determine his condition in the present one. Each man (person, ed. ), therefore, has prepared the causes of the effects which he now experiences. The obstacles to the attainment of good karma may be removed by the observance of the following precepts, which are embraced in the moral code of Buddhism: i.e. : (1) kill not; (2) steal not; (3) indulge in no forbidden sexual pleasure; (4) Lie not (5) take no intoxicating or stupefying drug or liquor. Five other precepts which need not here be enumerated should be observed by bhikkhus and all those who would attain, more quickly than the average layman the release from misery and rebirth. Buddhism discourages superstitious credulity. Gautama Buddha taught it to be the duty of a parent to have his child educated In science and literature. He also taught that no one should believe what is spoken by any sage, written in any book, or affirmed by tradition, unless it accords with reason, If I were a school student, I would be focusing on points 1. (no violence is allowed even in the name of one's religion), 2. (no creator god is needed to account for existence) and 9, (salvation is achievable by a man's own efforts in meditation).